4 year old, spayed and chipped, very fluffy female who has lived outside for most of her life but has adjusted well to life indoors. Very shy but has a lovely nature. Would not suit very young children but is making good progress and is happy to be around people . Tia was part of a small group of cats and so is very good with other cats and would best be homed as a companion to a friendly domestic cat that she can learn from. 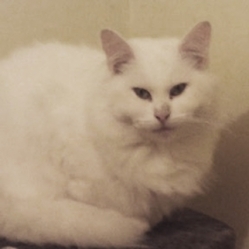 PLEASE MENTION YOU FOUND TIA ON CATCHAT - THANKS!